Creamy white with pale, salmony pink areas and darker, almost black inclusions. In the ancient world, Jasper was a favourite gem. The name Jasper can be found in Ancient Hebrew, Assyrian, Greek and Latin. Jasper is found worldwide. 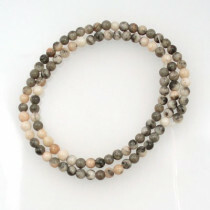 In jewellery, Jasper is usually named for it’s colour and pattern - and it is easy to see how this variety gets it’s name. Along with all the other attributes of Jasper, Pink Zebra Jasper is said to bring contentment. 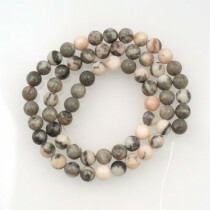 A-Grade Pink Zebra Jasper stone Round 4mm (~100pce Strand) - 40 cm /16'" Strand. 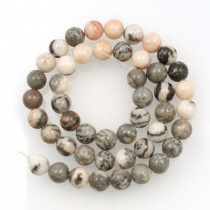 A-Grade Pink Zebra Jasper stone Round 8mm (~50pce Strand) - 40 cm /16'" Strand. 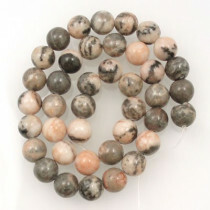 A-Grade Pink Zebra Jasper stone Round 10mm (~40pce Strand) - 40 cm /16'" Strand.